IBM staffers analyzed Boston traffic data then outlined the results at City Hall. Boston Mayor Thomas M. Menino asked the IBM team, which also worked with experts from Boston University, to tackle two big issues: How can the city quickly spot and undo congestion while slashing greenhouse gas emissions at the same time. 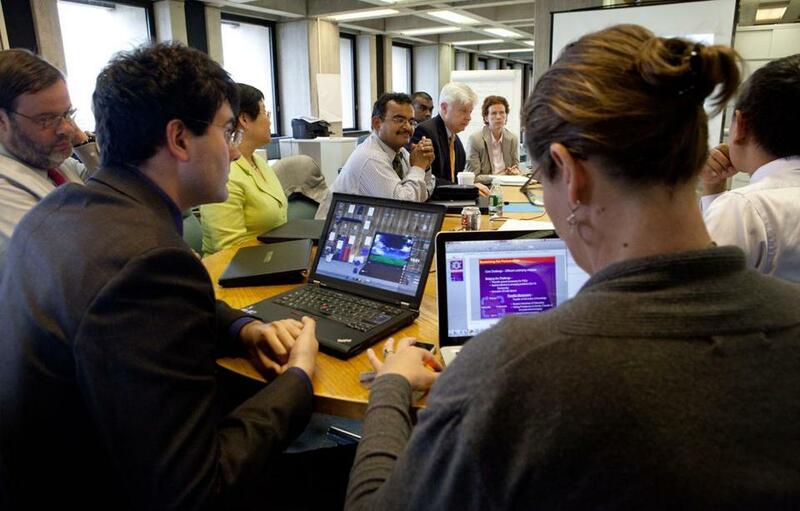 The IBM team’s answer to Menino’s task came in the form of an app. Of course there are already iPhone apps for tracking traffic, but the engineers helped the city build a prototype software application that unifies previously hard to find and disparate data from city computers, video cameras across the city, street sensors, and databases to show a real-time picture of Boston’s traffic. Menino said the prototype would not only become a tool for city planners, but could eventually make its way onto an iPhone, too. During the next six months, the city said, it will test the application and make some of its data available to the public. The six IBM engineers, who came from as far away as Tokyo, ended their work at City Hall on Thursday and left behind a set of preliminary recommendations that include using additional data sources such as cellphones and even Twitter posts to improve their understanding of the city’s traffic patterns. “There are literally millions of data points per second — from GPS and cellphone technology — that can be analyzed and made intelligent,” said Steve Wysmuller, environmental management system leader for IBM Global Services, who came from Somers, N.Y., to join the team working in Boston. For city planners, unifying all the traffic data not only gives them the ability to make on-the-spot adjustments to ease congestion, or even change traffic light patterns, it can let them know where bottlenecks regularly occur across the city. And there are a lot of them: The Boston area has the 10th-worst traffic congestion in the nation, according to the traffic analytics firm INRIX Inc. It also helps cut vehicle emissions by letting the city know where cars constantly idle in traffic, said Lucy R. Hutyra, an assistant professor in Boston University’s Department of Geography and Environment. She was on the team. “If we are actually going to move forward and regulate CO2 emissions, we need to figure out where they are coming from in a traceable manner. And that means data,” she said. IBM will formally present its recommendations later this year. The city did not say how much it would cost to fully implement the prototype.